You don’t have to compromise your health or your beliefs when you fly. 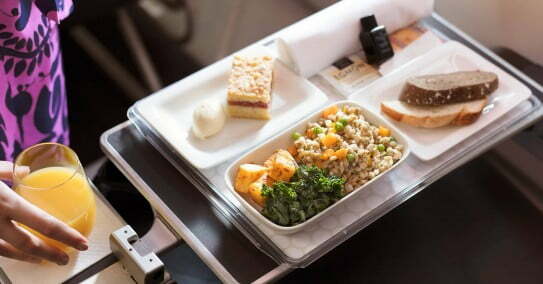 You can request a special meal on any long haul flight, and on other Air New Zealand flights where you've paid for a meal. There are a few ways you can order a special meal. When you book your flight you can request a special meal when you enter your personal details, under ‘special requests’. If you would like to request, view or change your meal after you’ve booked your flight, you can online via ‘Manage Booking’, or on the Air NZ mobile App, at least 24 hours before you travel. We provide many special meal options on our long haul international services, and some options on our shorter Australian and Pacific Island flights. If you’re on a connecting flight with another airline, contact them directly to arrange a special meal. If your flight is complex or on a partner airline, we may not be able to change your meal option online. Please contact us instead, and have your six-letter booking reference ready. View sample menus of the fresh, innovative cuisine we offer on board Air New Zealand flights as part of our regular inflight service. Visit ‘Manage Booking’ and enter your booking reference and family name. Select your special meal from the ‘Meal request’ drop down list, and click ‘save changes’. If you do not opt for a special meal, this will default to ‘Regular’. This meal is suitable for gluten intolerant but not gluten allergic or dairy intolerant customers (gluten – a protein of wheat, oats, barley or rye). This may contain one or more of the following ingredients: Salad, fruit, fish, lean meats, vegetables, dairy products and rice. Customers requiring gluten free are welcome to bring their own food onboard to ensure they aren’t exposed to possible glutens. This meal is suitable for Vegans or pure vegetarian customers following a strict vegetarian diet. This may contain one or more of the following ingredients: Fresh fruit and vegetables. It will not contain: fish, meat, dairy, egg products or animal products or by-products. This meal is suitable for vegetarian customers who consume egg and/or dairy products. This may contain one or more of the following ingredients: Vegetables, fruit, dairy products and eggs. It will not contain: meat or fish. This meal is available for vegetarian customers and is prepared in an Oriental or Chinese style. This meal is prepared Indian style according to Jain customs. This may contain one or more of the following ingredients: Fruit and stem vegetables that grow above the ground. This meal is suitable for customers with diabetes (high sugar levels) and is a low or no added sugar meal. This may contain one or more of the following ingredients: Lean meats, vegetables, fresh fruit, butter, low fat milk and plain yoghurt. It will not contain: sugar (some sugar substitutes may be used). This meal is available for customers travelling with an infant/s. A range of pureed packaged proprietary brand infant food is available on our flights, but we recommend parents carry preferred food for their babies. This meal is suitable for children, not infants, who can eat solid foods and are travelling on fares that include a meal option e.g. Works. This may contain one or more of the following ingredients: Milk and dairy products, fish, chicken, pasta, crackers, fruit and fruit juices. This meal is suitable for customers wishing to follow a fat restricted diet. This may contain one or more of the following ingredients: Rice, potatoes, fish, lean meats, egg whites, cottage cheese, margarine, cereals, wholegrain bread and fruit. It will not contain: Egg yolks, fatty meats, milk, cream or cheese. This meal is available for customers wishing to follow a fruit only diet. This meal is suitable for vegetarian customers and is usually prepared in a spicy Indian style with limited use of dairy products. This may contain one or more of the following ingredients: Vegetables, fruit and milk products. It will not contain: Fish, meat or eggs. This meal is prepared according to Hindu customs and respecting Hindu dietary practices and beliefs and is suitable for non-vegetarians. This may contain one or more of the following ingredients: Chicken, fish, lamb, eggs, milk and dairy products. It will not contain: beef. This meal contains ingredients chosen, prepared and served in accordance with Jewish dietary laws and customs. Please note: it cannot be guaranteed if requested within four days of travel or on flights from Rarotonga. This meal contains ingredients chosen, prepared and served in accordance with Muslim dietary laws and customs. This may contain one or more of the following ingredients: Fish, chicken, lamb, vegetables eggs, fruit and dairy products. It will not contain: pork or pork products, gelatine, alcohol, non-Halal prepared meats, shellfish or any other animal by-products; no Haram (forbidden) products will be used. Australia & Islands: Business Premier™ : Yes, all flights to Apia, Nadi, Papeete and Tonga require 4 days' notice. Not guaranteed if requested within 4 days of travel. You probably won’t be able to take your food past border control when you arrive at your destination, so leave any leftovers with us for safe disposal. Even our longest flights within New Zealand are fairly short. So instead of full meals, we offer mineral water, tea and coffee and a light snack. When you’re flying at breakfast or dinnertime: before 8am, or between 4:25-7:05pm. Your snack has a gluten-free option – just ask your cabin crew. If you or your children have allergy risks, you’ll be used to taking precautions. It’s the same when you fly. We do our best to keep you and our other passengers safe. But allergies and sensitivities are notoriously unique to different people, and it’s impossible for us to guarantee a risk-free and allergen-free environment for everyone. Peanuts are the most common allergen, so we don’t serve them on any of our flights. However, we can’t control what other passengers bring aboard, so we can’t guarantee there will be absolutely no trace of peanuts on board. If your allergies are severe, please bring food and drink you know is safe, and be prepared for emergencies. Please travel with prescribed medication and, if necessary, someone to help you take it in an emergency. Our cabin crew are trained in First Aid and have the ability to administer limited medications with provisions. Our International services carry a comprehensive kit for use by a Medical Doctor on board. Check our medical conditions page for more information, and to be sure your condition doesn’t compromise your clearance to fly. We can’t alter meals or snacks, or remove them from our flights, but you can check the menus for your flight before you fly. For more information, please read Air New Zealand's position on food allergies.